WE MAY HAVE iPods and iPads and iTunes and even flaming Samsungs today, but we do not have trains. Freight trains are nice, but passenger trains are lovely. One advantage of being vintage is that you had trains in your life, and now you have trains in your mind. A railroad track passes directly behind the house across our street. Freights thunder by day and night. My favorite is the 5:45 a.m. Who needs an alarm clock? Most passenger trains are gone, and we’re left with the occasional line that transports tourists. Alas. As a child I boarded trains at the huge station in Jacksonville, Florida, and rode 200-plus miles northwest to Sylvester, Georgia, where I stepped down onto dirt. Grandparents picked me up in an old Ford, and we drove to the farm on rutted, red-clay roads. One evening in 1962 a staff sergeant deposited me at the station in San Antonio, Texas, handing me a ticket and ordering me aboard. The Air Force paid for a solo sleeper to Rantoul, Illinois. I woke the next morning and watched a forest of white-barked birch trees passing. I’d never seen birches. Also courtesy of the Air Force, a few months later, I railed from Rantoul to the San Joaquin Valley of California, via Chicago. All the way across much of America. From New Orleans I would ride the elegant Southern Railway to Atlanta to visit my parents. “Southern Railway Serves the South.” It surely did. But not anymore. Traveling solo with two bottles of tequila, I rode in a sleeper from Mexico City to Ciudad Juárez. I stood outside on the bucking platform between cars and watched the desert mountains in the distance, which was romantic. With the woman who’s now my second ex-wife, I took a train from the English Channel to Paris, and a few days later an overnight sleeper to Barcelona. The following year found me on a train alone from Edinburgh to Inverness and a few days later, with a new traveling companion in the form of a lovely American anthropologist, aboard a train from Inverness to the craggy coast of Scotland. From there we ferried to the Isle of Skye. I stood outside, six days later, as my traveling companion, leaned out the train window (just like in the movies) as it pulled from the station in Chester, England, taking her to Wales. My ride, an hour later, went to London. Again with my second ex-wife, I took a train from Los Mochis, Mexico, to Chihuahua with an overnight at the Copper Canyon. After a following night in a Chihuahua hotel, we took a jammed, third-class train to Ciudad Juárez. That was in the 1980s, and it was my last train ride. 1978, Amtrak from Boston to NYC. That was my last one, not counting the cograils on Mt. Washington and Pikes Peak. John: That was a long, long time ago. And you obligated me to look up cog railway. Live and learn. Thanks. My husband, daughter and I took an Amtrak train from New Braunfels Tx to Union Station in LA about 15 yrs. ago … round trip actually. I loved the nothingness we saw. The negative part of the experience was when delays and such kept us from making “smoker stops.” That’s when I realized Amtrak was kept alive by the U.S. tobacco companies. People got downright belligerent when we missed one of those anticipated stops! Bev: Amtrak is pretty much a government railroad, so it’s no surprise there were delays. Smoker stops! Never heard of that. Last time I was on a train, you just smoked where you wanted, of course. Interesting that there were so many smokers on your train. Who smokes anymore? The ’50s, before I could read: various venues in Europe. 1958, when I could read: Kansas City to Los Angeles. My grandparents outfitted my sister and me in squaw dresses, which were the rage at the time, gave me plenty of reading material and decks of cards, and we shared the tiniest junior suite with my mother and infant brother. I would wander to the bar car and try to find people who wanted to play Old Maid with me. This was far more fun than the night flight to the Midwest, where the man sitting next to me was polite but not interested in hearing me read, and my red and white polka dot patent leather shoes hurt because they were too small. 1963: Los Angeles to Kansas City. Since my grandparents didn’t upgrade us this time, we sat in coach. I thought it was fun to stay up all night reading Death Be Not Proud. We drove a new car in the other direction. After that, trips meant either flying or driving. And then there were trains in Spain, trains in Argentina, and in 1990, a train from Buena Vista Station in what was then DF to Morelia and back. Ms. Rose: What stands out here is riding coach from Los Angeles to Kansas City, a long stretch, but nothing like the time I rode a Greyhound from Los Angeles to New York City in 1964. Five freaking days without a change of clothes or even brushing my teeth. In 1963, there were still dining cars with white tablecloths. My mother ordered 2 glasses of wine, one for herself and a very watered-down one for me. Maybe it was just to take the edge off of riding in coach, but I felt so important. Ms. Rose: On Southern Railway, there were white tablecloths on into the 1970s, perhaps even to its end in 1990. We Crackers don’t surrender our elegance easily. Don Cuevas: Took me a moment or two to figure out what you were responding to, but then I did. Not too far off base. Ah, we have uncovered the piece of Felipe that is romantically antiquarian. But I share the streak with you. Even though Amtrak has become just another part of the taxpayer-subsidized gray conformity that typifies governmental America, I would still like to take a trip one of these days around the perimeter of the country. I could take a suite, pull out my stationery, and write personal notes to all of my friends with my fountain while I watch America speed (or saunter) by my half-cleaned window. Señor Cotton: You overlooked the need to don your formal tails. Sir! Never on a train and in one’s state room. A crisp linen suit would be far more appropriate. Tails are for dinner and the opera. Alas, only one can be found on a train — no matter how grand. I too was placed on a train that fateful December, probably by the same sergeant. I was on my way to Madison, Wisconsin, home of the Truax Air Force base. I had to change trains in Chicago and go across town to the Milwaukee Road station. It was so cold; all of a sudden, I knew what the horse blanket of an overcoat the Air Force issued me was for. It was so cold, and the train did not leave until the next morning. I went across the street to the theatre and watched “Taras Bulba” all night just to keep warm. The theatre was full of people doing the same thing. When I was about five or six, my father, two brothers and I took the train from Phoenix to Amarillo, Texas. We were going to his family’s ranch. It was our first train trip. The toilet fascinated us. Whatever went in there was dumped down onto the tracks. We experimented. But finally, we found an empty whiskey bottle that just couldn’t make the trip. A railroad maintenance worker was called in to the remedy the situation. She was a black lady wearing bib overalls. She was not happy. We had never seen a black lady in bib overalls. We were picked up by an uncle with his cattle-hauling truck. We were put out that he put the luggage in the back with all of that cow stuff. Train travel in Mexico was a lot different. We had compartments. There were two types. Those called camarines were just a bed that was made up over the toilet. It was like sleeping in a coffin. If one had a call of nature it was a problem. The other type was called alcoba. It had two beds that were a lot more comfortable. It also had fans that worked only when the train was running. There was no guard on the fan, so one had to be very careful. The train would leave Nogales sometime in the afternoon. Then it would wait at Benjamin Hill for the train from Tijuana and Mexicali. Sometimes it took a long time, but beside the tracks there were puestas that sold the best tacos. A bunch of hitting and bumping followed as the trains were joined. We loved it. You know if you buy a frozen turkey at Pucchi’s market in Nogales, it will be thawed and ready for the oven by the time you get to Guadalajara. Señor Gill: If there’s a moral to your story, and surely there is one, then it’s that one should not let 5-year-olds spend time in train toilets, especially if it’s going to piss off a black lady in bib overalls. I think the moral was “always go to the front of the horse and the back of the cow.” Durn thing just about killed me. My last train trips were to Mazatlan with the boys. The wife wouldn’t go. The highlight of that last trip was the train hitting a car. We never found out the story behind that. But the train was held up for hours. People got out and answered the call of nature right there in the jungle. Watch your step. I think it was in Culiacan the train stopped in the middle of the night and a couple of old ladies got on. They had the compartment next to us. Whoose, whoose. They were spraying down the compartment. Then they set of a bug bomb. Roaches came out of everywhere. Back then, my oldest spoke a lot of Spanish. He tortured the mozo with a lot of questions. Dang, Señor Gill, you’ve got some good train yarns. Omaha to San Francisco, 1958. Two days and two nights in coach. Mom and Pop and five very young siblings. A lotta fun for us kids, probably not as much for Mom and Pop. Omaha to Kansas City 1963, down and back on the same day. Birthday present to see Mickey Mantle vs. the then Kansas City Athletics. Mazatlán to Tepic, January 1972. Spent the whole time outside between the cars, with the glorious tropical sun on my face as we passed the endless cane fields. Perfect antidote to the gloomy PNW weather I’d left behind. Gordie/Clete: The best part of a train, ride-wise, is that outside platform between cars. No place to sit, however. I have always wanted to take a train trip. There has been some talk of reviving rail transport from Chicago to New Orleans, but I doubt that will happen. As you may know, Alabama is home to the worst Amtrak disaster — Big Bayou Canot near Mobile. I’d still take my chances. Seems like a great way to see the country. Ray: You’re telling me you’ve never, ever taken a train ride? Well, you’re relatively young compared to some of the old folks weighing in here. Train times have changed, and they’ve been changed for years. You’ve missed one of life’s great experiences. So what happened with Pena Nieto’s promise to bring back rail passenger service? Forgotten, gone like a fart in a high wind. Señor Gill: How right you are. I too had forgotten about that. But that’s the least of his concerns right now, I imagine. And I imagine the voting public is regretting bringing back the PRI after sensibly having PAN presidents for 12 years. When the trains at night go by I hear the lonesome whistles blow in the distance. It reminds me of my early childhood in Minnesota before I moved to Florida. I traveled all over Europe by train in the 1960s whenever I got a few days off from my Air Force duties. It was a great way to travel. Andrés: And still would be a great way to travel in the our Northern Hemisphere if more options were available. But I’m not optimistic. 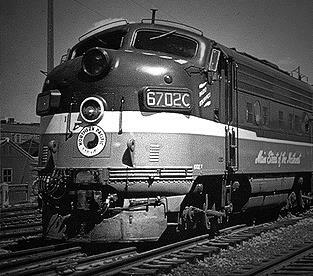 May 15, 1972, I was part of a crew that was assigned to do a story on Amtrak and its rebirth. I remember the date because it was the same day that George Wallace got shot. We left Oakland on the way to Chicago on the California Zephyr Amtrak. It was one of the most memorable trips. I still fondly remember today. We were treated like VIPs and almost had the whole run of the train. We were allowed to go up to the engines and even through the door which brought you outside on the guard rails above the track. I am sure that nothing like that would ever be allowed today because of liability reasons. The conductor and engineers also showed us stuff that would be forbidden nowadays. We had our own sleepers, all the food and drinks were comped along with the trip. I remember the train stopping in towns like Provo, Glenwood Springs, Denver and seeing the back rural scenery of America. The accommodations were not the most luxurious: Half of the stuff didn’t work and needed a lot of maintenance. We seemed to spend a lot of time in the lounge car enjoying the refreshments. It was funny that going through the various states the bar would open and close at various times and days. When we arrived in Chicago we did our interviews with the big wheels at Amtrak and then took the train down back to California ending in L.A. What a marvelous way to travel. The U.S. missed the boat on this form of travel. Tancho: That sounds like it was quite a trip. I envy you on that. I may be mistaken, but I don’t think I have ever ridden on Amtrak.